I’m in San Diego this week, attending a Radiology conference. The city has a dazzling skyline, and I wanted to photograph it tonight. I scoured the internet and contacted a few local photographers. My investigation yielded two possibilities: Coronado Island and Harbor Island. 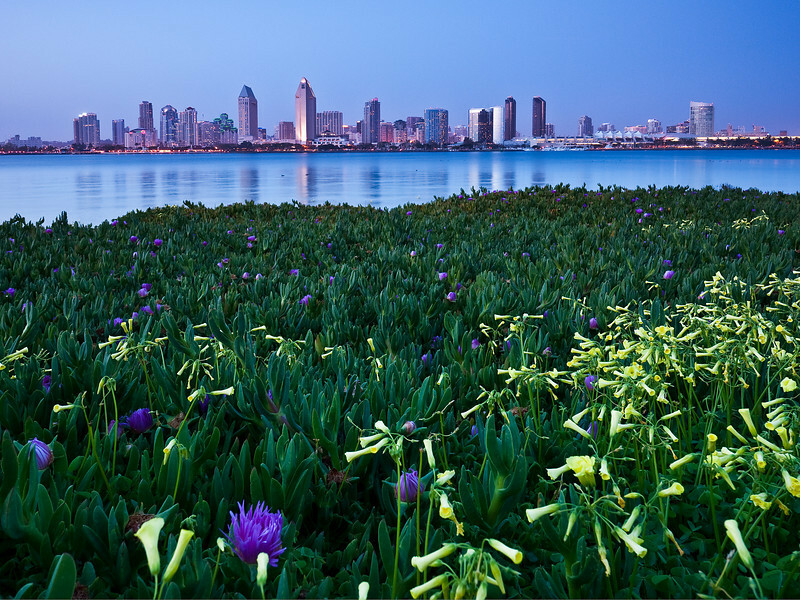 For no particular reason, I chose Coronado Island. Perhaps I’ll visit Harbor Island tomorrow evening. I arrived about an hour before sunset, allowing myself plenty of time for exploration and to scout out potential spots. The visibility wasn’t the best, and the skyline looked a little hazy while the sun was still up. Once the sun set and the building lights came on, the emerging scene looked more promising. I found two spots that included interesting foreground elements. On the first shot, my tripod was very close to the ground, as I wanted to feature the lovely purple and yellows wildflowers scattered in a bed of green vegetation. On the second, I included some beach rocks, illuminated by overhead sidewalk lamps. Luckily, the Coronado pedestrian ferry was docked, and I was able to incorporate it in the midground. Dude these images rock! Glad to see you’ve been out shooting and enjoying your new rig man! Conrad, thanks bud! I’ve told you this before…the little Panny is a gem, man…at any price! The first image is fantastic. Did you combine a couple of exposures or is that a single exposure? Jeremiah, thanks! Both shots are single exposures. For the first, I was lucky the flowers didn’t move too much during such a long exposure. Had there been any kind of breeze, I would have had to ISO bracket. Sandeep, thanks a lot, man! San Diego is a great place! Wow Mahesh! This is a virtual treat!! Thank you! JoAnn, thanks for the comment! I’m glad you enjoyed the shots. I still like Seattle’s skyline better, but SD also has a very nice one.